What you need to know about traveling in Japan around the holiday period. Let’s start with the good news, the Japan Rail Pass is valid year round and can be used during the entire holiday period without any extra fees. The not so good news, trains are quickly reserved, especially the intercity and Shinkansen. This won’t be a problem with a little bit of planning. We recommend that you make seat reservations 3-4 days ahead of traveling for the period of Dec 28th to Jan 2nd. This way you’ll be able to secure seating. Don’t worry though, even if seats are fully reserved you can still come early to the station and queue for a non-reserved seat. Worst case is that you’ll have to stand without a seat reservation but you’ll get to your destination for sure! Should I buy a 1st Class Pass during the holiday period for travel in Japan? One of the questions we get asked a lot around New Year is: should I use a Green Class (1st Class) pass to be secure of seating? The answer is, probably not. If you pay for Green Class, then you want to be in Green Class and keep in mind that trains usually only have 1 carriage with Green Seats, so it won’t really give you a better chance of securing a seat. That said, the reason why you may want to consider a Green Class Japan Rail Pass is to travel in more comfort and quiet and it’s a great way to avoid some of the traveling crowds. What you need to know about each specific day. Known as ‘Tenno Tanjoubi’ in Japanese, the birthday of the emperor is celebrated on the 23rd of December and is a national holiday. As this falls on a Sunday in 2018, it is observed the following Monday the 24th. Smaller stores and restaurants may be closed while department stores and larger establishments usually operate as normal. Transport is run on a Sunday/Public holiday schedule, which can mean a lower frequency of service, especially outside of bigger cities. In 2018 this will be the last time this takes place in December. Next year the emperor is scheduled to abdicate moving the date to 23 February, the birthday of now crown prince Naruhito. 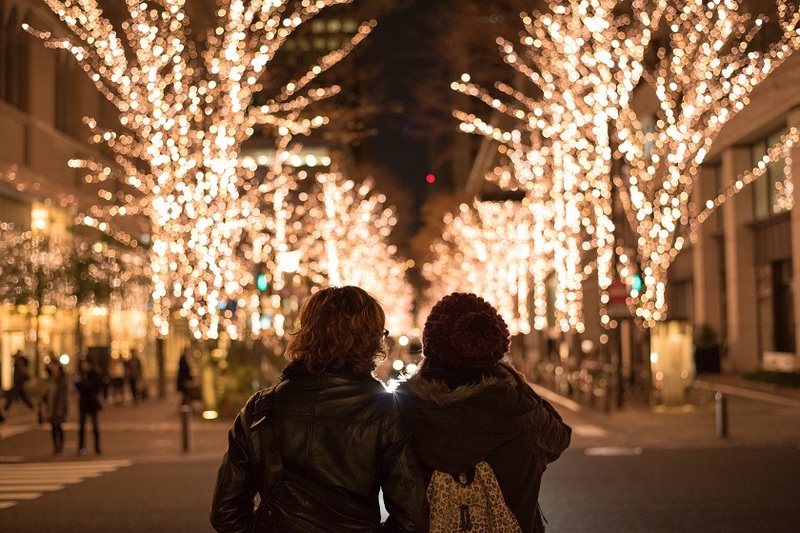 Many streets and places are illuminated during the holidays, making for a romantic admosphere. Although Japan is historically not a Christian nation, that does not prevent anyone from enjoying the Christmas period. With merry decorations all around, lit up trees and all kinds of seasonal foods – it’s a great time to visit. For those looking to enjoy winter sports, there are top-notch resorts in Hokkaido and Nagano. Where you might gather with your family in other countries, in Japan it is customary to take your loved one, partner or date on a romantic dinner on Christmas Eve. As a result, better restaurants are often booked well in advance and you might have a hard time finding an empty seat at the more uptown establishments. Other than that, Christmas Eve is quite a normal day and stores are open as usual. Trains run as usual too. Christmas day is not a bank holiday in Japan, in fact people work as normal and stores/restaurants are open for business as usual. The same goes for transport. Try tasting a Japanese Christmas cake, a light sponge cake – covered in a layer of whipped cream and decorated with ripe strawberries, or better yet – make one your own. Boxing day – 2nd day of Christmas. Like Christmas day, this is a normal day in Japan, though festively dressed. Transport operates normally and most people will be at work. New year period (28th of December – 2nd of Jan). The new year period in Japan is busy, like really busy! It is customary to celebrate the new year with your family and people are traveling all across the country. As said before, make seat reservations 3-4 days in advance for any day within this period to be secure of seating. NYE is mostly celebrated with family and friends at home. Stores and restaurants may close early. There are special local trains in cities like Tokyo and Osaka post midnight for party goers. There are big firework displays but these are at designated view points only. Popular places to watch the year countdown are Shibuya square crossing and at Tokyo Tower. Crowds gather at big temples to ring the bell after midnight, such as at the Yasaka Shrine in Gion, Kyoto. Called Oshogatsu, this is traditionally the most important day of the year. It is the moment to start a new year with your family and loved ones. Locals wake up early to see the sunrise, symbolizing the dawn of the new year. A visit to a shrine or temple is customary, to ring the temple bell and welcome good fortune for the new year. Most stores and smaller restaurants will be closed but larger department stores, from fashion to electronics, have made it a practice to open and sell special “Fuku-bukoro” or “lucky bags” that often contain bargains. Transport operates on a public holiday schedule and intercity trains are often fully booked. On Jan 2nd and 3rd, people will be traveling back home. Intercity trains and Shinkansen will be busy, advanced reservations are required. PS: Don’t forget to pack yourself a “Pocket-WiFi in Japan”https://www.jrpass.com/pocket-wifi for your trip, this way you can wish your friends and family a happy new year live from Japan!